For me, brownies are difficult to get absolutely perfect. It’s not just the ingredients, it’s the baking time. I’ve been known to not only overcook, but undercook my brownies also. It’s usually just me, being a perfectionist and all! I strive to get the perfect brownie. The Hummingbird Bakery comes to the rescue with their recipe, which is so simple to make with lots of room to adapt. I brought these in for my last day at college, and people loved them! I personally thought I had undercooked them, but maybe because I popped them in the freezer overnight this could have helped. I’ve changed the dark chocolate to milk chocolate. This may be too sweet for some, even though i’ve taken a bit of the sugar out, but for everyone they were really good. If this isn’t for you, and you want a bitter edge to your brownie, just change it back to dark chocolate! This recipe can be adapted to add nuts or whatever you want too. 2. 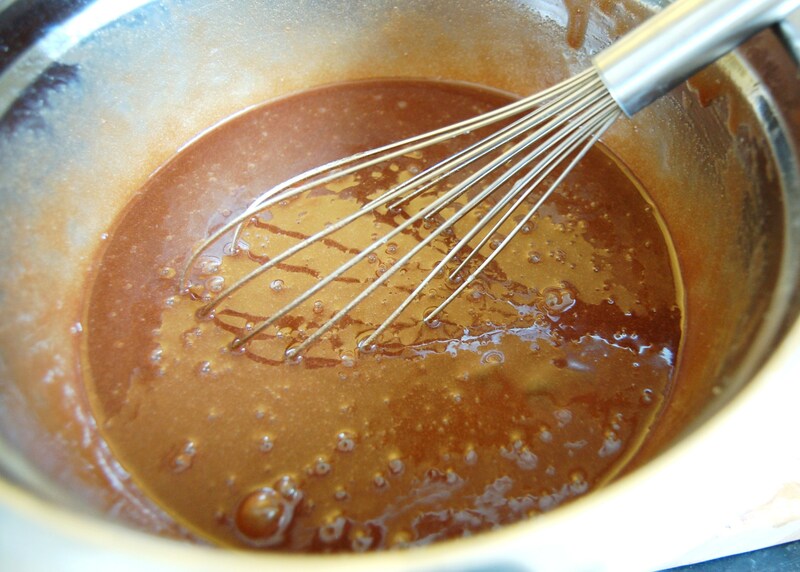 Put the chocolate and butter in a heatproof bowl over a saucepan of water on a medium heat. Don’t let the bowl touch the water. Leave this until everythings melted and remove from the heat. 3. Add the sugar and stir. 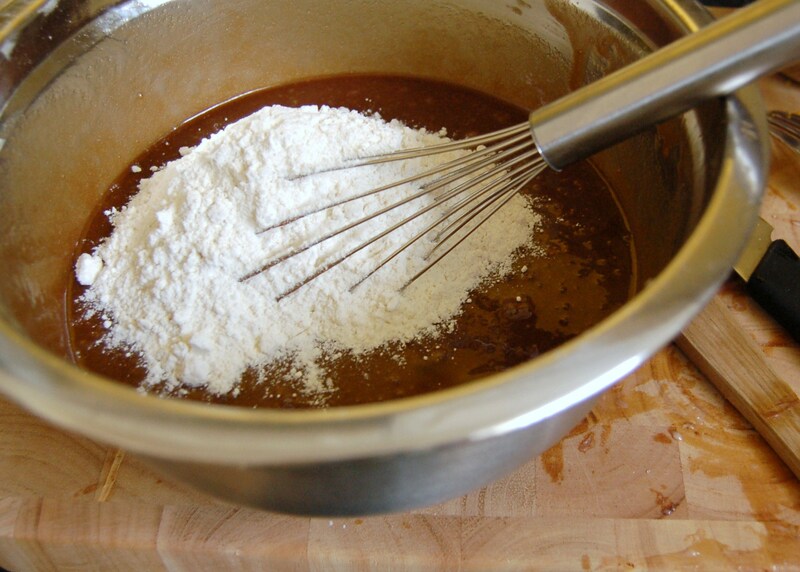 Add the flour and stir until everything’s encorporated. Finally, mix in the eggs until everything is thick and smooth. 4. 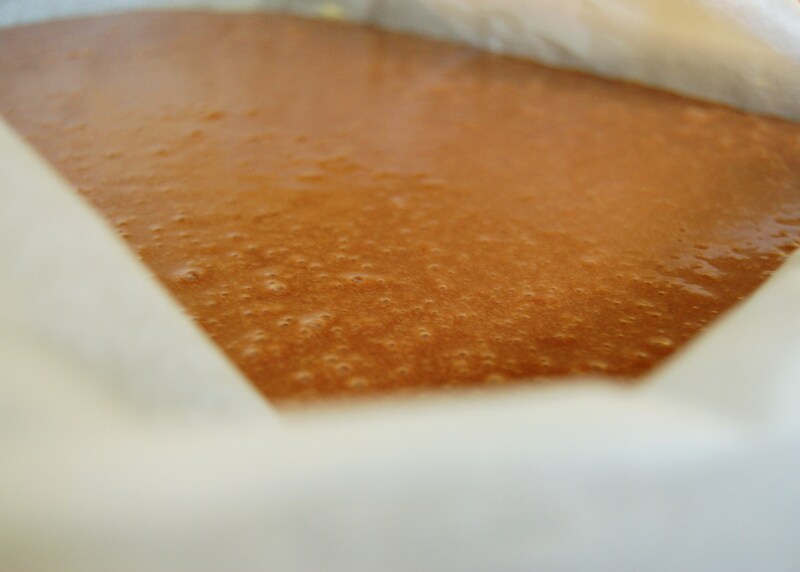 Transfer the mixture into a baking tray lined with greaseproof paper. Bake for 30-35 minutes until it’s flaky on top but soft in the centre. If you put a toothpick or knife in, it should come out without any gooey mixture, but not 100% clean. Just so a few bits cling on. Leave to cook until you cut it. A helpful hint; as soon as you take the brownies out the oven, put them in the freezer. This gives it a cleaner cut, as well as sorting out the texture if you’ve slightly undercooked them. 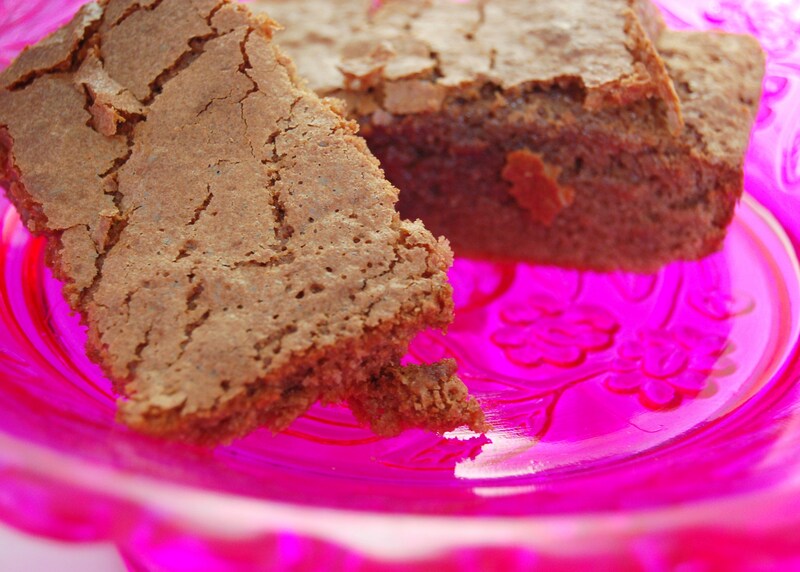 Undercooked is better than overcooked with brownies! I will have to agree… it is not easy to make a perfect brownie… and as it sounds and looks, your recipe and method just did it!!! Thanks to you both. It’s worth a go! I like how simple your brownies are. Just 5 ingredients and that’s it. I’ll probably go with the dark side, loves bitter chocs! I’m gonna try making this, they look like they could be easily halved. Thanks! 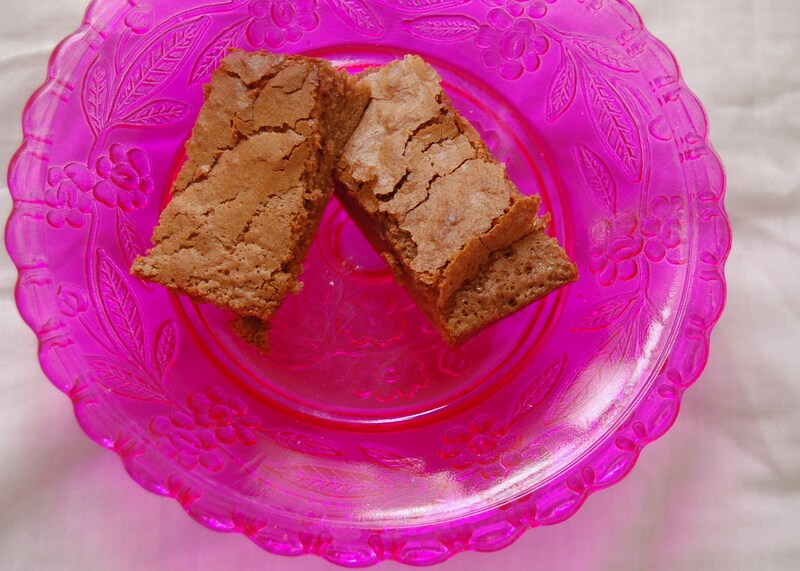 stumbled upon your blog when reading comments on joy the baker.. ( yup im weird like that) this brownies look great! love the flaky top look but never succeeded. gonna try out this one sometime! Quinn – I think its good to have few ingredients, then you can always add flavours if you wish. Simplisity is the best! 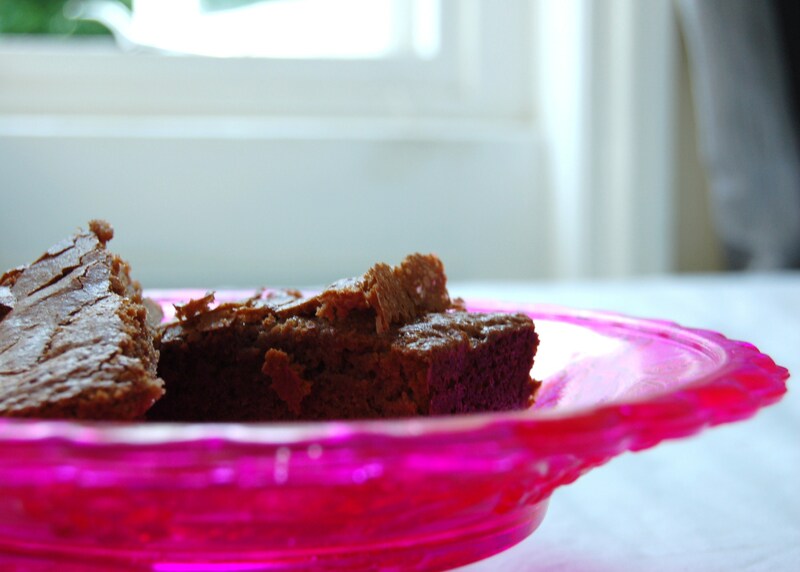 Kangli – Its the quantities of ingredients that you use I believe, I’ve had brownie recipes which differ in quantity of the basic ingredients and this affects how the top of the brownie cooks!